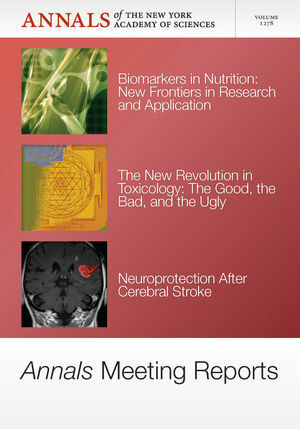 This Annals volume presents three scholarly meeting reports: (1) biomarkers in nutrition: new frontiers in research and application; (2) the new revolution in toxicology: The good, the bad, and the ugly; and (3) neuroprotection after cerebral ischemia. Nutritional biomarkers—biochemical, functional, or clinical indices of nutrient intake, status, or functional effects—are needed to support evidence-based clinical guidance and effective health programs and policies related to food, nutrition, and health. Such indices can reveal information about biological or physiological responses to dietary behavior or pathogenic processes, and can be used to monitor responses to therapeutic interventions and to provide information on interindividual differences in response to diet and nutrition. Many nutritional biomarkers are available; yet there has been no formal mechanism to establish consensus regarding the optimal biomarkers for particular nutrients and applications. In 2007, the United States National Academy of Sciences issued a report entitled Toxicity Testing in the 21st Century: A Vision and a Strategy. The report reviewed the state of the science and outlined a strategy for the future of toxicity testing. One of the more significant components of the vision established by the report was an emphasis on toxicity testing in human rather than animal systems. In the context of drug development, it is critical that the tools used to accomplish this strategy are maximally capable of evaluating human risk. Since 2007, many advances toward implementation of this vision have been achieved, particularly with regard to safety assessment of new chemical entities intended for pharmaceutical use. Cerebral ischemia, a focal or global insufficiency of blood flow to the brain, can arise through multiple mechanisms, including thrombosis and arterial hemorrhage. Ischemia is a major driver of stroke, one of the leading causes of morbidity and mortality worldwide. While the general etiology of cerebral ischemia and stroke has been known for some time, the conditions have only recently been considered treatable. This report describes current research in this field seeking to fully understand the pathomechanisms underlying stroke; to characterize the brain's intrinsic injury, survival, and repair mechanisms; to identify putative drug targets as well as cell-based therapies; and to optimize the delivery of therapeutic agents to the damaged cerebral tissue. Douglas Braaten is the editor of Annals Meeting Reports - G Protein-Coupled Receptors, Complex Drugs and Regulatory Guidance, Fetal Programming and Environmental Exposures, Volume 1276, published by Wiley.